As you eat your cereal in the morning, you notice it on the side of the box—that small, white rectangle with the jumble of words, numbers and percentages. 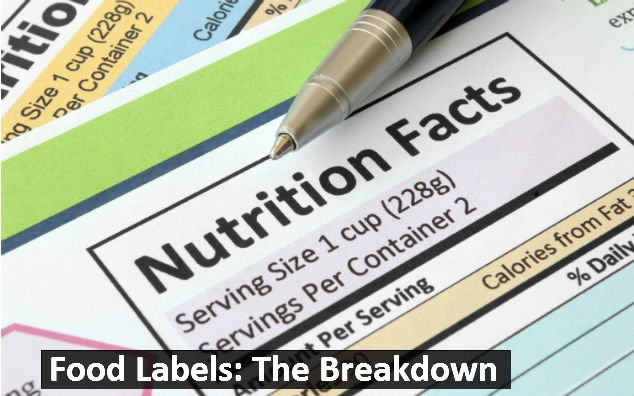 It’s the nutrition facts label, and it breaks down what’s inside the box—everything from calories to cholesterol. Reading it can be a little confusing, but by breaking it down, you’ll have a clear understanding of the value the information provides in helping you maintain a healthy diet. A serving size is the recommended amount of a food that should be eaten by one person. It is important to pay attention to the serving size because the item you’re eating may contain several servings. This means that if you eat an entire bag of chips that contains three servings, you’re really eating three times the calories, fat, etc., that are listed on the label. This number indicates the total number of calories and the number of calories which are derived from fat that are contained in one serving of food. You should aim for getting only about 30 percent of your daily calories from fat. These percentages tell you how one serving of food fits, nutritionally, into a daily diet of 2,000 calories. Food companies must list, at a minimum, the amount of fat, cholesterol, sodium, total carbohydrates, dietary fiber, sugars, protein, vitamins A and C, calcium and iron that are contained in one serving of a product. Some labels also display trans fats. The required nutrients were chosen because they relate to current health concerns, such as coronary artery disease, diabetes, high blood pressure and obesity. This shows the maximum amounts of total fat, saturated fat, cholesterol and sodium, as well as target amounts for total carbohydrates and fiber, that should be consumed each day. This is based on a suggested diet of 2,000 calories. 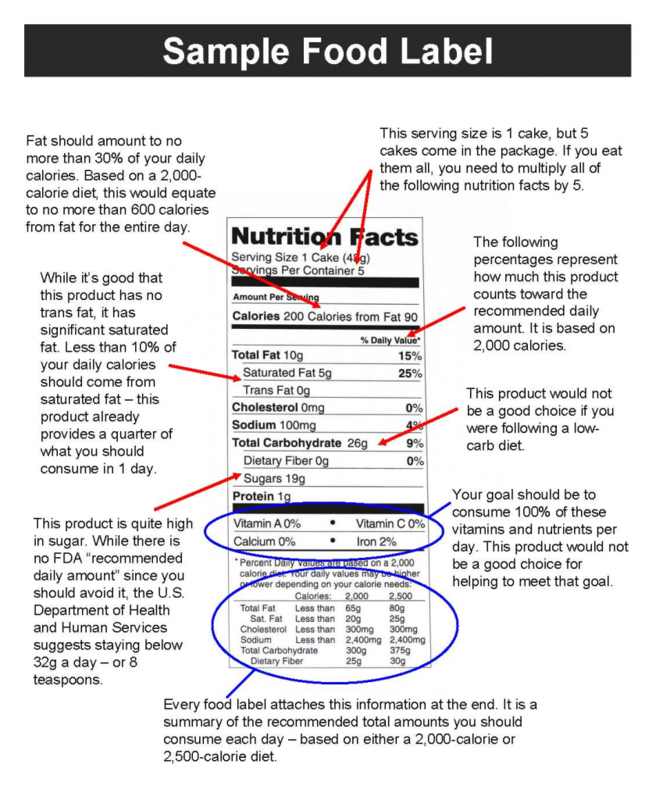 Reading food labels is a crucial part of maintaining healthy eating habits. It allows you to make informed choices about the foods you eat and compare the nutritional value of different foods. A good diet and an active lifestyle can help your body stay healthy and disease-free. Please share this with friends, family, co-workers, employees. Click here for the printer-friendly PDF version.